You are here: Home / Tennis Equipment / 2015 Babolat Pure Aero tennis racquet coming! 2015 Babolat Pure Aero tennis racquet coming! As you know, I try to stay ahead of the curve when it comes to tennis racquets and tennis strings; here we are again! I got some inside information regarding the latest Babolat line of tennis racquets, Babolat Pure Aero. What’s new on the Babolat Pure Aero tennis racquet? Well, obviously the first thing that you notice is the paint-job; it’s gone a bit more two tone with black and neon yellow, unlike the current version which is black, yellow, white, silver, and a little red. Probably the biggest change on the Babolat Pure Aero tennis racquet is the lack of “Active Cortex System.” If you don’t remember your Active Cortex technology, it reduces shock and vibration, leaving the player with a cleaner feel at impact. The lack of Active Cortex on the Babolat Pure Aero is a bit concerning because if it will have the same racquet stiffness as the current Aero Pro (RA 69), you’re going to have some arm issues playing this frame. The current version plays very stiff already, even with the Active Cortex; I can’t even imagine what it would feel like to play the Babolat Pure Aero without Active Cortex. Might have to pick up a few elbow braces! I don’t have additional information on other technologies. Babolat Pure Aero price and release dates? 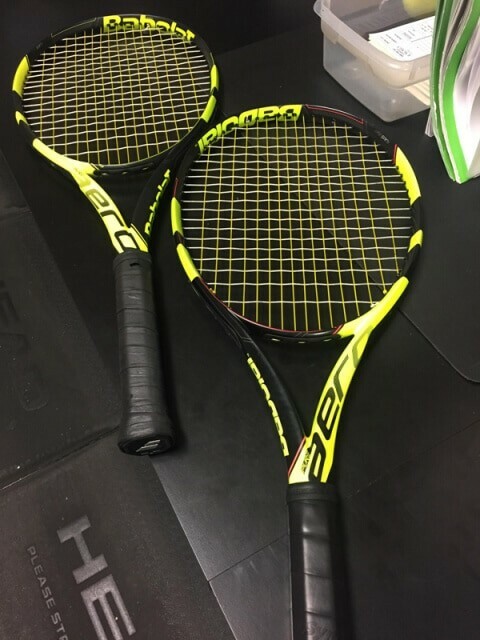 So far as I was told, the Babolat Pure Aero will be released early September, and likely available for pre-order from Tennis-Warehouse a few weeks before that. From what I saw, the MSRP for the Babolat Pure Aero will cost around $220 US with a PLAY version coming in at about $350. So nothing extraordinary coming from Babolat. Will Rafael Nadal play with the Babolat Pure Aero tennis racquet? I can only assume that Rafa will play with this frame. He’s been playing with the brand for the entirety of his career (played with Pure Drive as a junior), though I don’t imagine that the Babolat Pure Aero is going to be much different than what he currently hits with; he’s been using the first generation of Aero Pro (with custom weighting and painted Cortex system) since he picked up the racquet.